In Lesvos, in the middle of Europe’s refugee crisis, Hazel Healy finds tragedy, hope – and answers. Tired Greek coastguards meet for a drink after they finish work for the day. They have just pulled 242 refugees out of the water. It was the worst shipwreck in the sea near Lesvos since the refugee crisis began last year. Outside there are many wet, salty clothes on the stones. The floor of a very small church is full of people who survived the shipwreck. They have blankets and are trying to sleep. At the door of the church, Salman, a Syriac Christian, is walking up and down. He left Qamishli (N. Syria) with many other Christians from the Middle East after the invasion of Iraq. The last rescue boat arrived a long time ago. But his 27-year-old cousin is still missing. His uncle and aunt phone him again. A young Yazidi woman, Linda, talks to a doctor. She has many blankets around her, but she is shaking with shock: ‘I had my son in the water for an hour, then I lost him.’ She left Bashiqa (N. Iraq) 14 months ago with her two young children. ISIS fighters were coming – they were one day away. The doctor takes Linda back to look through some of the people lying on the top floor of a port building. An official walks past with lots of papers – the names of 38 missing people. The refugees – mostly from Syria, but also Iraq and Afghanistan – started on the 10-kilometre crossing from Turkey in a large wooden boat, on the afternoon of 28 October. The smugglers said this boat was better than the normal rubber boats and made them pay up to $2,500 per person. But the boat was very weak and thin. People who said it was bad had to leave at gunpoint. After 40 minutes, there was a lot of wind on the sea. The top deck crashed into the lower deck; the boat sank in a few minutes. ‘It was like a disaster movie,’ says Feroz. He used to do PR for the Free Syrian Army. ‘Everyone was screaming. There were so many kids around me – the life jackets didn’t work for them, the waves were going into their mouths.’ He shakes his head. ‘We paid money to die.’ Deaths we could stop The UN refugee agency has found that 90 per cent of people who came to Europe by sea last year came from the top-10 refugee-producing countries of the world. So why are refugees paying money to die? Because of the bad asylum policy in Europe. This makes refugees and migrants take responsibility. The 1951 UN Refugee Convention, agreed after the terrible wars in Europe, protects people who are escaping persecution and can also protect people coming from areas of conflict. It 145 nations countries signed it. But there is a problem: people can only ask for asylum when they are inside your country. So countries try to stop them arriving. The Schengen Agreement allows people to move freely between some European countries. It has pushed the border of Europe to Greece, Italy, Spain and the Balkans. Amnesty International says the EU spent $2 billion between 2007 and 2013 to stop people coming across that border. Most asylum-seekers dream about coming to Europe legally, and they know this is not possible. In 2014, the UN resettled only 104,000 of the world’s refugees directly from camps: this is less than 0.1 per cent of the total number of refugees. Slowly the land routes into Europe have been protected and cut off. People need visas to enter by air or ferry – so this is impossible. And family reunion is restricted to very few. So refugees have to make very dangerous journeys and pay smugglers. Linda, the mother I met in Molyvos harbour, was travelling with 20 members of the persecuted Yazidi community. They have a good reason for needing protection under the 1951 convention. She wanted to go to her parents in Germany. They drove to Erbil in Iraqi Kurdistan and flew to Istanbul. Then they had to pay more than $35,000 (a ferry ticket costs $15) to travel together on a ‘cardboard’ boat that sank. 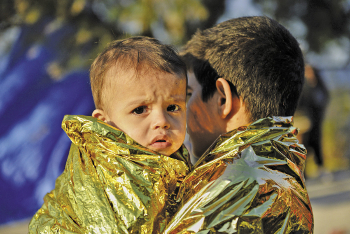 Linda’s 18-month-old son Joud was one of 90 children that died in the Aegean Sea in October. About 3,600 people have died on Europe’s Mediterranean border in 2015. So the beaches of Lesvos – where half of the refugees enter Europe by sea – feels like a war zone. Europe’s asylum policy offers protection but also stops people getting protection. So most people think it’s a good idea to take the risk. If you’re Syrian, like 50 per cent of those coming to Europe across the Med, you will almost certainly get asylum. Europe is failing refugees. But we can see from history that it does not have to be so bad: so many refugees with nothing getting to an island of 85,000 people that cannot support them all. ‘There are 19.5 million refugees in a world population of 7 billion. We can look after them,’ says Alexander Betts. He is Head of the Oxford University Refugee Studies Centre. And he knows a lot about of all the refugee crises in history. He tells me that most refugees are in the Global South. Ethiopia has 650,000 refugees; Iran has nearly half a million. The whole of Europe with 700 million rich people, has not even taken as many refugees as Lebanon. 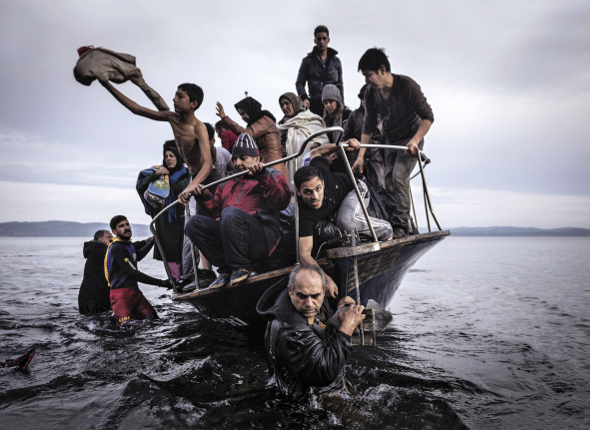 The world can manage refugee crises, and has done this before. In 2015, a million refugees arrived in Europe - according to the International Organization for Migration (IOM). This is difficult, but we have found good ways to help in the past. For example, between the two World Wars, there were Nansen passports. They helped 450,000 refugees travel between 1922 and 1942. Europe has also managed crises nearby. In the 1999 Kosovo War, 850,000 refugees crossed the border into Macedonia and Montenegro. The UN quickly took 100,000 people (a temporary humanitarian relocation scheme) to every country in Europe. In the Hungarian crisis of 1956, 180,000 refugees left to Austria. In a few months, there were only 410 Hungarians. 36 countries took the others eg. the US and Paraguay. All refugee crises are different; people make mistakes in all of them. But they show that the world can act together when it wants to. In the late 1970s, thousands of refugees left Vietnam, Laos and Cambodia in small boats, to Southeast Asia. There were too many for the countries they went to - like Lebanon, Turkey and Jordan now - and thousands died in the sea. But the UN agreed an ‘Orderly Passage programme’ to stop the sea crossings. When the crisis ended in 1996, 1.6 million were found new homes, mostly in the West. This time, some European countries eg. Germany and Sweden have been very kind. But other countries are not helping. The EU agreed a plan to share the refugees in September 2015, to help countries Greece. But four months later, only 160 people have been moved (they agreed 160,000). Other countries have agreed to take some refugees eg. the US has agreed to take 10,000 Syrians, Australia 12,000 and Canada 25,000. But this is only a small percentage of the 4.2 million who have left the Syrian war. This looks like a crisis of politics, not numbers. ‘How many sandwiches did we make today, Stelios?’ asks Melinda, at her restaurant, the Captain’s Table, in Molyvos. It is now a meeting place for refugee support. Stelios thinks: ‘More than 5,000’. So many sandwiches for new arrivals. Melinda thinks they are spending $10,000 to help refugees every day. If governments will not help, people of Europe will. 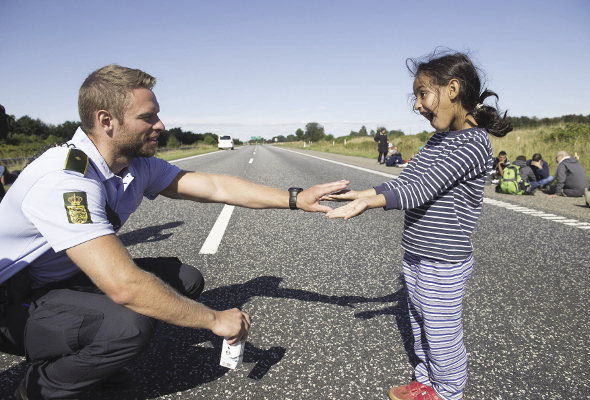 As so many refugees come into Europe, many more people are helping. These volunteers are helping because Europe is not helping. The volunteers pay for themselves. Most of them help local groups. Many of them bring a lot from groups back in their country. They also help the work of international NGOs and the UNHCR – they were late to come to Greece. In the camps to the south of the island, people must register before they move on to another country. And there are different levels of help - like a ‘humanitarian caste system’. Syrians, stay in Kara Tepe camp because they have a good chance of acceptance as refugees. Pakistanis, Iranians and Afghans have to go to Moria, with terrible conditions, because they will probably not be accepted as refugees. They get food there from volunteers from Pikpa. The Pikpa village started in 2012. It is a reception centre run by volunteers. They especially help people with illness or bereavement. It is peaceful after the beaches, and full of sadness. As I walk in, a little girl walks up and hugs me, then goes to do some art work. Leo, a Syrian volunteer in his twenties, shows me around. 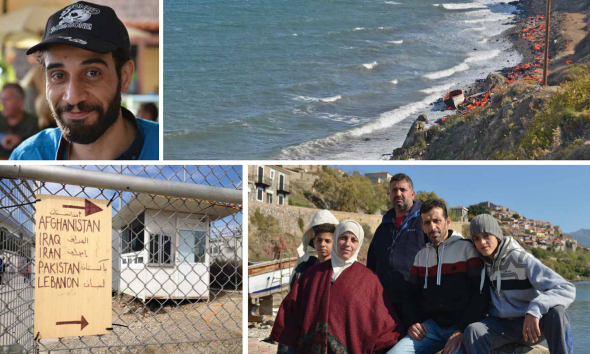 He left Damascus three years ago, lived in Lebanon and Turkey, then entered Greece at the land border illegally. He could not continue to work 12 hours every day at half-pay and pay double rent. There is a very good moral reason for letting the refugees travel safely. We have seen this is possible in history and in the law. So why is Europe – and the rest of the world – not helping? Probably because many people think that migration is the cause of all the problems in the 21st-century. Dutch academic Hein de Haas says the Left has problems with migration now because they talk only about humanitarian arguments, not practical arguments. ‘You can’t persuade people to have the same values as you,’ he tells me, when we meet in an Oxford bookshop. Instead, he has spent years researching the numbers. He has studied migration and policy over the past century in 163 countries. And he has learnt amazing things, eg. that border controls have often created more settlement, not stopped it. For example, until early 1990, Moroccans did not need visas to enter Spain. They came for seasonal work and then left. When they started to need visas, immigration from Morocco increased greatly. And people stayed and didn’t go back to Morocco. ‘If people could come to work with no visa, many of them would come, look around, and go home,’ he says. He says that many things people say about migration are not true. There is no ‘invasion’ – the same percentage of the world’s population is migrating now as before - about three per cent. There is not much evidence that people migrate to get welfare either. Migrants move where they can find work and the economy is good. And on balance, they contribute more to economies than they take away. And they send back a lot of money to families in their country – much more than international aid. His final point was this: as poor countries get richer, their citizens are more likely to migrate, not less likely – this is related to development, and aid will not stop it. De Haas says we should be more worried that migrants will soon choose to go to India and China, and not to the West. He says that now there is more north-to-south migration. The ‘problem’, he says, is not the movement of people but xenophobia (hating people from other countries), and politicians and the media make this worse. In the Oxi transit camp, there are people from Afghanistan and Somalia. A Somali man says he is ‘Captain Phillips’. He asks for sandwiches for the 13 in his group who are texting on their Samsung phones. He talks about the difficult routes through Dubai, Iran and Turkey. He decided to leave Somalia because of a bomb that killed a Chinese diplomat in Mogadishu in July and threats from someone linked to Islamist terror group Al Shabaab. An Iranian DJ, Farzad, wants to be free to party in Switzerland, where his cousin lives. It’s only when you stop this flow of migrants that you get a crisis. In Mytilene, the capital of Lesvos, the following day, hundreds of Greeks are demonstrating in support of refugees. Migrants clap and film the march on their phones. But we do not yet have political humanitarian solutions. Boats are still sinking, there are many tragedies. And the EU have just made a $3.3billion agreement with Turkey, to keep refugees out of Europe. ‘How are we going to stop people? Keep them in Syria? Where are these people going to go?’ asks Rae McGrath. He is the director of Mercy Corps relief operations in Turkey and northern Syria. He says it is difficult to see the movement of people into Europe as a ‘crisis’- after stopping food aid to 621,000 homeless people in areas controlled by ISIS in early 2014. ‘When do we start shooting refugees?’ he asks. There is another possibility. And we can start building it now. The UN needs $20 billion for its humanitarian budget for 2016 (two-thirds of what Britain paid to save Lloyds Bank Group or the cost to the US of two-years of bombing ISIS in Syria); the world must share responsibility for refugees, and allow people to move safely; people moving to new lives would stop dying tomorrow if we have open land borders, reception centres for refugees and the possibility for refugees to legally travel by plane. Before we have all this, we need search-and-rescue in the Aegean Sea now. We must fight for political solutions. So people can go back to their homes and live in peace, or come and live in Europe and the West (countries that helped make the wars, and create this unstable, unequal world). And it is very important to fight against the people who are against refugees. The far right is becoming more popular in Sweden, Austria, France and Switzerland, and the proto-fascist Pegida is getting more support in Germany. But many people still support refugees. Many people in Athens voted for Syriza again, sometimes only because they are good to migrants. This is very important because there will be more big migrations in this fragile, mobile world. This crisis is only the first. People will continue to come. We have to expect it and not be afraid. It is impossible to close borders without so many people dying. People who do this only see people as numbers. Anyone who has seen men, women and children dying on the beaches of rich, peacetime Europe knows this is wrong. We can, and must, do better. NOW READ THE ORIGINAL: http://newint.org/features/2016/01/01/humanity-adrift/ (This article has been simplified so the words, text structure and quotes may have been changed). This page was last edited on 19 January 2016, at 22:07.